Free Shipping Included! Gun Magnet | Gun Mount Holster | Magnetic Gun Mount | Concealed Carry Holster for Car, Truck, Home, Office, Handgun, Pistol, Shotgun, Rifle by AZ Industries at Practical Tactical Podcast. Hurry! Limited time offer. Offer valid only while supplies last. 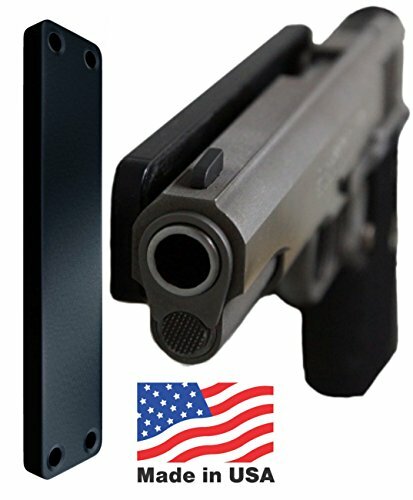 REVOLUTIONARY PATENTED GUN MAGNET -A new way to secure and store guns & magazines anywhere. -Large Surface Area for Better Grip & Easy Removal. -A new way to secure and store guns & magazines anywhere. -Large Surface Area for Better Grip & Easy Removal. -Strong, easy and effective for all guns & magazines. -Provides easy, quick access for a quick draw. Keep your Firearms and Magazines within reach at all times. -Built-to-last with top quality manufacturing 100% Made in USA. -Manufactured with pride by Americans. -Strong hold for country, dirt or bumpy roads. -Ideal for Men, Women & Tactical Use. Easy removal. -Tested with Local and Certified Tactical Police. -In Vehicle- cars, trucks or SUVs for CCW (carrying a concealed weapon). -In Gun Safe- better and easier than pockets or pouches. -In Home or Office- under shelves, desks or nightstands, closets, bedsides, above doors, walls and more. Rubberized strip installed prevents scratching & marring and improves grip. -Simple Installation. Mounts with included wood or machine screws. All Hardware Included. -Made with Super Powerful Rare Earth Magnets. -Use 2 Gun Magnets for rifles, shotguns, or other longer-barreled guns. -Patented longer design doubles for use with Firearms or Magazines. The Pistol Magnet- The ORIGINAL Low-Profile Bar Design Gun Magnet. Revolutionary, Patented Gun Magnet Design. Mount Anywhere in Your Home, Office, Safe or Car. Won't Scratch Your Firearms. Police Tested, Tested For Men & Women. Ideal for Men, Women, Law Enforcement or Military. 100% Made In America. American Pride and Quality. Works with all brands from Glock, Smith & Wesson, Ruger, Sig Sauer, Springfield, Walther, Mossberg, Kel-Tec, Heckler & Koch, Browning, Colt, Taurus, Rossi, Beretta, Winchester, Remington, FN Herstal, Winchester, USP and more! Quick Draw for Fast, Easy Retrieval of Handguns, Rifles and Magazines. View More In Indoor Gun Racks. If you have any questions about this product by AZ Industries, contact us by completing and submitting the form below. If you are looking for a specif part number, please include it with your message.